2014 Toyota 4Runner Pros and Cons: Why (Not) This Car? I wasn't planning to review the 2014 Toyota 4Runner. It looks a little different than the 2010-2013, and its infotainment systems are now Toyota's latest, but the stuff that counts remains the same. I'd driven the (at the time) recently redesigned 2010 for a week, and found its on-road handling clumsy. It was the opposite of what I personally look for in a vehicle. Anyone who wasn't going to engage in some fairly serious off-roading or towing would be better off in a car-based crossover (since they won't buy a wagon) such as Toyota's own Highlander. This is why the 4Runner is one of the few remaining sub-$50k true midsize SUVs--the others being the recently updated Jeep Grand Cherokee and new-in-2005 Nissan Xterra. Then a close friend bought a 2014 4Runner. I was baffled. He explained that the top-of-the-line Limited, with its own suspension system, rides and handles far better than the base trim SR5 I'd driven. Really? This I had to see for myself. I needed to spend another week with the 4Runner after all. Perhaps there are more good reasons to buy one than I realized. Attractive upholstery inside the Limited, but for some reason silver instead of black plastic trim. 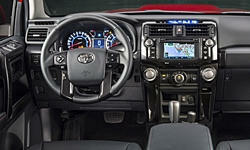 Why the 2014 Toyota 4Runner? The current Jeep Grand Cherokee is a very impressive vehicle. As I'll discuss in more detail below, it does many things better than the 4Runner. So why didn't my friend buy the Jeep? Largely because he did not trust it would be reliable. It's record has been so-so in recent years, and the 2014 updates included some glitches. Conversely, the Toyota 4Runner has consistently been among the most reliable models in TrueDelta's car reliability survey. Because of its well-earned reputation for reliability, the Toyota 4Runner holds its value extremely well. According to kbb.com, a ten-year-old 4Runner Limited is still worth about $13,800. A ten-year-old Jeep Grand Cherokee Limited? Only about $9,200. Chunky, upright, traditional SUV proportions. Tail lamps might be a bit much. Center stack looks like a 1980s boombox. In the Limited, one with some faux timber. Many people were originally drawn to SUVs in search of a commanding view in traffic. They'll like the view from the 4Runner's driver seat. The seat is high, the windshield is relatively upright, the hood is long and level--thoroughly old school SUV, with no car-like swoopy stuff. Combine this driving position with the 4Runner's chunky styling and rock-solid, unabashedly truck-like feel, and you can't help but feel tough, even unstoppable while driving it. Even for me, with my decided preference for cars, the more compact the better, this rugged character has a strong visceral appeal. The Grand Cherokee's driving position, while still very much that of an SUV, is more modern. You don't sit as high relative to the instrument panel, which is deeper to accomodate a more laid back windshield. Some curves in the mix make the front corners harder to place when parking. It also feels tough, but this toughness is alloyed with sophistication, like an athlete dressed in a well-tailored suit, so it doesn't permeate the driving experience as strongly. The 4Runner's thoroughly conventional SUV construction (unlike the Jeep, it has a separate body and frame) does make for a big step up into the seats. On most 4Runners fixed running boards are a $345 option. On the Limited, $1,500 running boards power up under the body while driving, then automatically lower (with a surprisingly loud whir) when a door is opened. For me, they got in the way more than they helped, so I turned them off. My friend opted for dealer-installed fixed step bars on his Limited. Both the Toyota and Jeep have roomy second-row seats that are high enough off the floor to provide thigh support for adults. Only the Toyota offers an optional third row seat, but it's too tight to be of much use. If you want a useful third row in this sort of vehicle, check out the Dodge Durango. The Durango is essentially an extended, less off-road-capable Grand Cherokee. Its third-row seat is about as comfortable as you'll find in this size SUV or crossover. The 4Runner's boxier styling pays dividends in cargo capacity. Cargo volume is 46 cubic feet with the seat up, and 89 cubic feet with it folded. The Grand Cherokee? Only 36 and 68 cubic feet, respectively. One minor hitch: if the front seats are much of the way back it's not possible to fold the second row without moving them forward. After folding the second row the front seats can be moved back. Why Not the 2014 Toyota 4Runner? Unlike other 4Runner's, the Limited is fitted with Toyota's X-REAS "sport enhancement suspension." This system hydraulically cross-links each shock with the one at the opposite corner, to steady the ride over uneven roads and reduce lean in turns. In casual driving, the 4Runner Limited does lean much less than the SR5. Push the Toyota a little harder, though, and it still leans considerably more than the Jeep. In anything beyond the most casual driving, the 4Runner (Limited or otherwise) also feels far less balanced and poised than the Grand Cherokee. Its default state is heavy understeer--a desire to plow towards the outside curb. But plunge into a turn especially hard (or change lanes vigorously) and rear end sway threatens to overwhelm the outside rear tire. The stability control system cuts in early and hard to quash this incipient oversteer. Vague steering further undermines any sense of precise control. The Limited's optional full-time all-wheel-drive system (other 4Runners get a part-time four-wheel-drive system) makes for less dramatic effects when applying the gas or engine braking while turning. This could be especially beneficial on periodically slick roads, where a part-time 4WD system could not be engaged. The throttle can be used to partially mitigate the default understeer. Given the inherent clumsiness of the 4Runner's chassis, grippy tires probably wouldn't be a good idea--they'd make any scary stuff happen at higher speeds, and less gradually. No need to worry. The Limited's wheels are larger than those on other 4Runners, 20s instead of 17s, but the tires they wear are 20mm narrower, 245 rather than 265. Plus they're Yokohama Geolanders--not a performance tire by any stretch of the imagination. Upshot: the shorter sidewalls on the Limited's 20-inch tires benefit handling by squirming less in transitions, but give up pretty early, with plenty of squeal to let you know what's going on. Though far from a sports car itself, the Grand Cherokee handles far better than the 4Runner. Its chassis has sufficient balance and poise to provide the basis for a credible high-performance variant, the Grand Cherokee SRT. My friend loves how his 4Runner rides. But he lives in Virginia, where the roads are relatively smooth. On the winter-scarred roads of Michigan, the 4Runner Limited's ride often feels lumpy, jiggly, and squirmy to the point of annoyance. The SR5's suspension absorbed bumps and potholes better. Though the Jeep's ride retains some truckiness, it's considerably smoother and more composed than the Toyota's. Limited has a less fierce, chromier fascia than other 4Runners. Roomy rear seat a comfortable height off the floor. The 4Runner has a few unique features, most notably its signature power window in the tailgate. The optional third-row seat was mentioned earlier. But there are many features you can get on the Jeep Grand Cherokee Limited that you cannot get on the Toyota, including a height-adjustable air suspension, a panoramic sunroof, adaptive cruise control, auto-dimming xenon headlights, a heated power tilt-and-telescoping steering wheel, ventilated front seats, and heated second row seats. And there are two trim levels above the Grand Cherokee Limited that add more opulent furnishings, including a leather upholstered instrument panel and real wood trim. For this sort of luxury in a Toyota, you've got to buy the related Lexus GX. The 4Runner's dated powertrain--its automatic transmission is down three gear ratios compared to the Jeep's--and brick-like aerodynamics aren't good for fuel economy. EPA ratings are just 17 city, 21 highway. The Jeep with its V6 engine does the same in city driving, but 3 mpg better on the highway. Plus you can get a diesel engine in the Jeep, and it rates 21/28. In real-world suburban driving, I managed to coax the 4Runner's trip computer average as high as 24.6, but high teens and low 20s were more typical. On the highway the trip computer reported 20.5, close to the EPA rating. 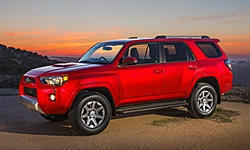 The 4Runner's 270-horsepower 4.0-liter V6 performs about as well as the Grand Cherokee's 290-horsepower 3.6-liter V6. Either is easily adequate for typical suburban driving. Mat the accelerator, and either can get from a dead stop to 60 mph in about eight seconds. But if you want to experience an adrenaline rush from serious thrust in your SUV, you're out of luck with the Toyota. From 2010 onwards the V6 has been the only available engine. In constrast, a pair of V8s are available in the Jeep, one with 360 horsepower, the other in an SRT performance model with 470 horsepower. Unlike Jeep, Toyota didn't try to make its SUV pretty. Instead, the 4Runner's boxy, upright sheetmetal and fierce face (toned town for the Limited) suggest it could drive through anything it couldn't drive over. It's up to you whether this styling is appealing. Even in the Limited you'll find much of the 4Runner's instrument panel covered in chunky silver plastic--a look that was trendy about a dozen years ago, and upscale never. Big knobs are good for ergonomics, but make boombox flashbacks inevitable for anyone alive in the 1980s. The handsomely upholstered door panels help compensate. Off-road capability is a strength of the 4Runner--but not so much this 4Runner, the Limited. If you'll be doing fairly serious off-roading, the Trail is the one you want, with standard selectable terrain modes, crawl control, and lockable rear differential, plus optional KDSS disconnectable stabilizer bars. Or maybe the new TRD Pro, which has upgraded dampers and front springs, but lacks the KDSS option. In other words, you can't have both the Trail's off-road capability and the Limited's luxury features in the same 4Runner, while you can get trick off-road bits and upscale features together in the Jeep. I haven't specified a relative rating in this category because I didn't perform any off-road testing. Truck-based SUVs tend to be better suited for towing than car-based crossovers. Oddly, though, the 4Runner's tow rating is a crossover-like 4,700 lbs. It doesn't fully deliver on a traditional strength of the genus. The Jeep is rated to tow much more, 6,200 lbs. with the base V6 and 7,400 lbs. with the V8 or diesel. This said, I'd much rather tow about 4,000 lbs. with the 4Runner than with a car-based crossover, as the transmissions in the latter, with their more compact components, aren't as rugged. Equip the 4Runner Limited and Grand Cherokee Limited with 4WD, 20-inch wheels, sunroof, nav, and trailer hitches, and the Toyota lists for a little less, $43,530 vs. $44,420 (2015 prices). But the Jeep more than compensates by including additional features worth about $2,000. One note: the Jeep as configured does not include an uplevel sound system. To roughly match the 4Runner Limited's standard 15-speaker JBL system, you have to add a $4,200 Luxury Group that also includes features not available on the 4Runner (auto-dimming xenon headlights, power tilt-and-telescoping steering column, ventilated front seats). The Nissan Xterra costs considerably less than the Toyota or the Jeep, but is much cruder and isn't available with nearly as much upscale content. A week with a Toyota 4Runner Limited didn't discover a vehicle much more suited to on-road use than the lesser trim levels. The X-REAS system reduces lean in turns, but the chassis remains clumsy, and ride quality suffers. The Jeep Grand Cherokee rides and handles far better, while offering more sophisticated styling and more upscale features. So why get the Toyota 4Runner? Off-road capability is one good reason, but to maximize it you'll want the Trail or new TRD Pro, not the Limited. Towing is just so-so. Ultimately, the top reason remains the 4Runner's legendary reliability and consequent strong resale value. But reliability and resale value aren't everthing. The 4Runner isn't one of those Toyota's that's basically an appliance. Amidst the crossover onslaught, it retains an abundance of undiluted SUV character. Even more than the Jeep, which might have become overly refined for some tastes, the Toyota looks like a truck, feels like a truck, and drives like a truck. For better or worse, depending on what you're looking for, it's unquestionably the real thing. Solid, adequately powerful 4.0-liter V6 engine. About twenty cubic feet more than the Jeep with the seat folded. Benefit of a tall, square body. Toyota and Jeep each provided an insured vehicle for a week with a tank of fuel. 2014 Toyota 4Runner pros and cons, according to Michael Karesh: the best reasons for buying (or not buying) the 2014 Toyota 4Runner. Join TrueDelta to post your own impressions. We drove a 4Runner Trail for a week and really enjoyed it. It's unquestionably a truck, but taking that into account, it was great. Good review. I've tried to capture how satisfying this truck can be to drive--as a truck--but you might have done a better job of this.